When buying a classic car as an investment, documentation that details the car’s original parts and options, like a Marti Report for classic Fords, can go a long way in easing the minds of those interested in authenticity. Sellers can command premium prices for something that is proven to be correct or original, and buyers will generally agree to pay if it means the car is more likely to hold or increase its value over time. Numerous methods can be used to verify the originality of the parts if you know where to look. Fender tags, door tags, engine stamps and VIN numbers are among them. Some of these can be reproduced, and may indicate information that is no longer accurate to the vehicle they’re on. Regardless of this fact, they all exist as an alpha-numeric code that points to information originally held in the manufacturer’s production database. It’s almost unbelievable to learn that those original records would have been destroyed, but there was a time when the cost of storage prohibited companies like Ford from maintaining such extensive records. Original production records were purged or destroyed on purpose. In an effort to increase motor vehicle safety, the United States passed the National Traffic and Motor Vehicle Safety Act of 1966, which required that manufacturer’s maintain records on the vehicles they produced to help facilitate any necessary recalls. While the records were now kept, they still weren’t accessible by the public. In the case of Ford, it would take automotive archivist and historian, Kevin Marti to finally put the information to use for collectors. 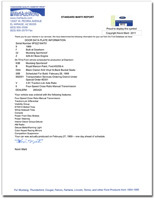 Kevin Marti worked with Ford to get access to their production database from 1967 to 1993. 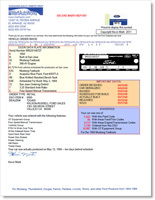 As a result, you can get a Marti Report for any Ford, Lincoln or Mercury manufactured in the United States or Canada from 1967 to 1979. Mustangs and Capris are available through 1993. While other vehicles have parts replaced as they ride down the road of time, some remain original to their factory specifications. A Marti Report can prove that by telling you exactly what your car left the factory with. There are three levels of Marti Report, with each delving a little further into the information available for the car. 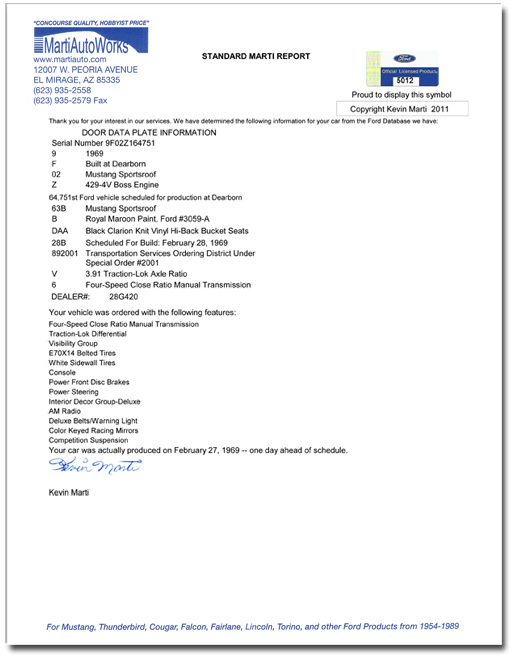 The most basic is the Standard Marti Report, and includes a list of the options the vehicles included when it was produced. A Deluxe Marti Report adds production statistics, a simulation of the the door data plate and any significant dates in the car’s history. An Elite Marti Report adds a reproduction of the window sticker and personalizes the production statistics so you’ll know exactly how many other cars were made like yours. They matte and frame it as well! Below you’ll find images of each of these reports, but you’re encouraged to visit the Marti Auto Works website to learn more! 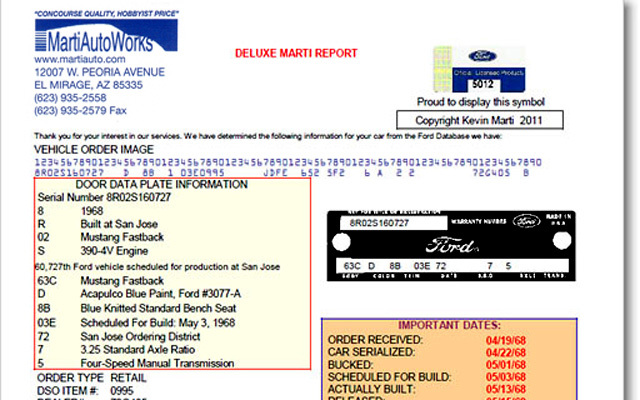 These days, a Marti Report is widely regarded as the definitive method of proving a classic Ford’s authenticity. 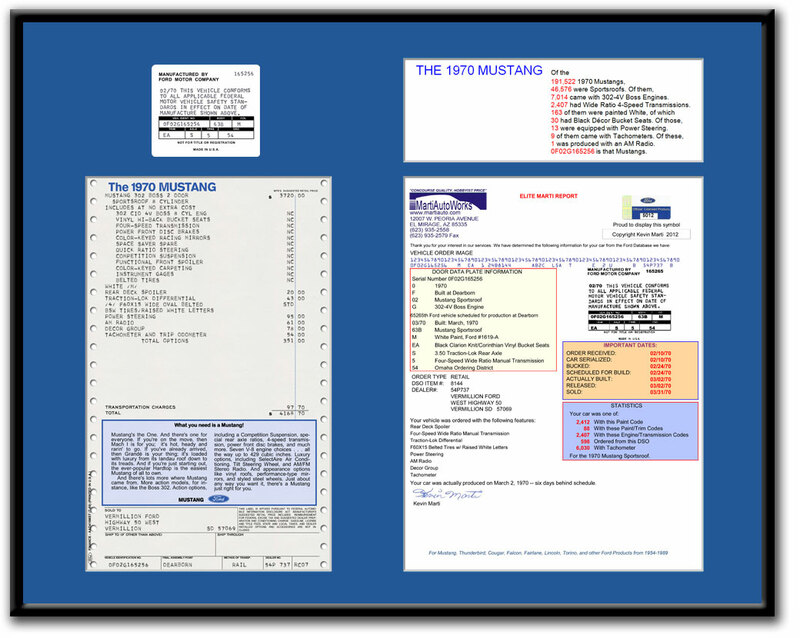 Thousands of reports are ordered each year, with the most popular being for Mustangs. Ford trucks, Mercury Cougers and Fairlane/Torinos follow suit. A new buyer can expect to see numerous vehicles for sale with a Marti Report listed as feature. A car that’s meant to accrue value can benefit from having its key components verified as original, or its combination of features unique. That’s the kind of thing that others are willing to pay top dollar for. If you don’t expect the car is rare, or don’t care about selling it in the future, then a Marti Report might not be necessary. Collectors might still pursue a Marti Report to sate their curiosity though. For classic Ford, Lincoln and Mercury owners, there’s no better method of learning about the original incarnation of their car than a Marti Report. If you’re hunting down a rare vehicle, don’t dismiss the inclusion of a Marti Report as something superfluous. Along with other numbers present in the vehicle, you can use it to be sure of what you’re buying. That kind of confidence is hard to come by in the hobby of collector cars. Marti Auto Works in El Mirage, Arizona is the home of the Marti Report, but you can buy one over the internet at their website, www.martiauto.com. They offer many other services to help in the preservation of classic cars. 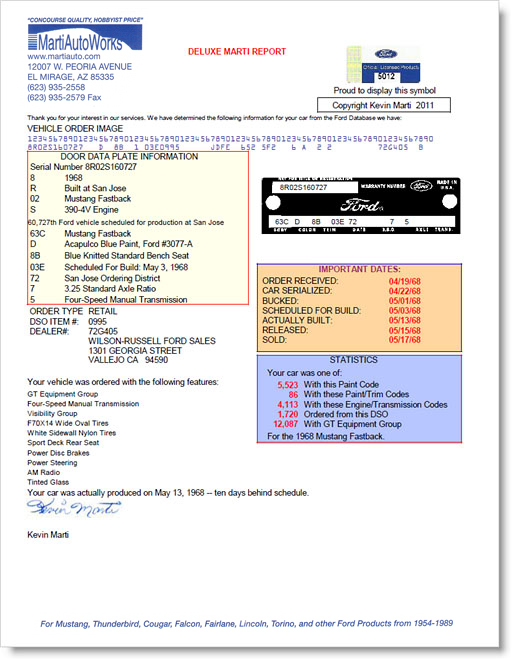 In addition to the Marti Report, you can get original invoices rescued from Ford by Lois Eminger, replacement tags, NOS parts and reproduction window stickers. If the preservation of a classic Ford is your goal, Marti Auto Works provides a wealth of tools you’ll want to be aware of. 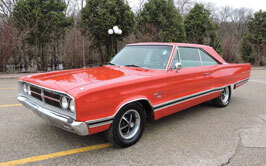 Hi this is Dan Whitney I have a 1966 Fairlane GT Convertible. can I get a Marti report for this car? I read that you only go back to 1967? Thank you. I need your help. I bought a 56 t-bird and the vin data plate is missing. I was hoping you could help if I give the vin #. M 6 FH 336718. It took a lot of convincing at the registry to prove the vin # without a data plate. Please advice what I can do. i went to the marti web site and it is unavailable. what do i do now i need a data plate in case i sell the car.